Fabcar Perth proudly has on offer Fabspeed’s latest Porsche Cayman GT4 GT420 Street Performance Pack making over 400hp at the wheels! 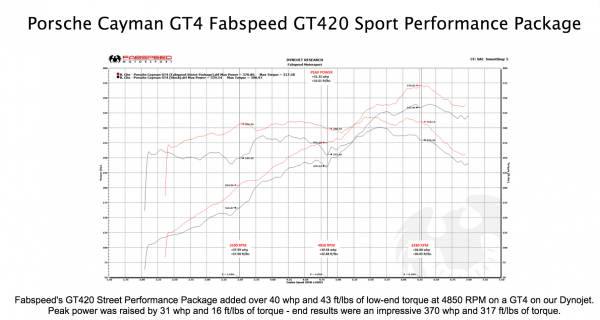 Fabspeed’s GT420 Race Performance Package is the final answer in GT4 performance. Delivering over 400 horsepower to the wheels with easy-to-install bolt-on upgrades, there is no better option for the GT4 owner seeking maximum power and performance. No need to swap engines or suffer long periods of downtime during a full engine re-build. Simply install the Fabspeed GT420 Package and begin outperforming the 911 Carrera GTS the very next day! 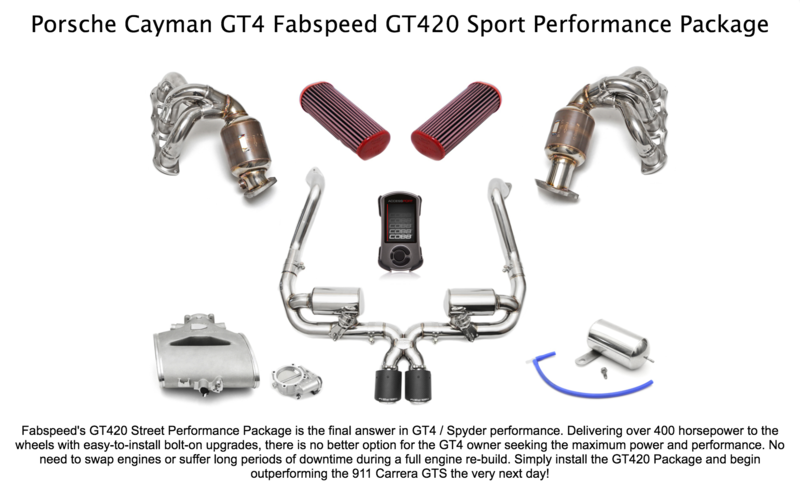 After numerous months of development, Fabspeed is proud to offer a complete power solution for the GT4. With a crowd of Porsche Club of America members looking on, they eclipsed the 400whp mark on their Dynojet. Fabspeeds esteemed tuner has extracted power from thousands of vehicles, and has proven that the GT4 has further untapped potential when paired with a number of performance enhancing components. 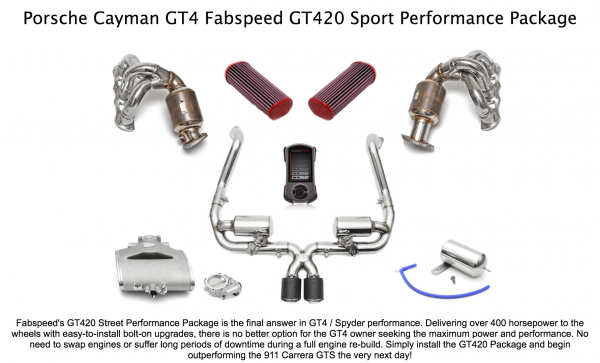 Get the ultimate sound and power upgrade for your GT4 and dominate the track or street. 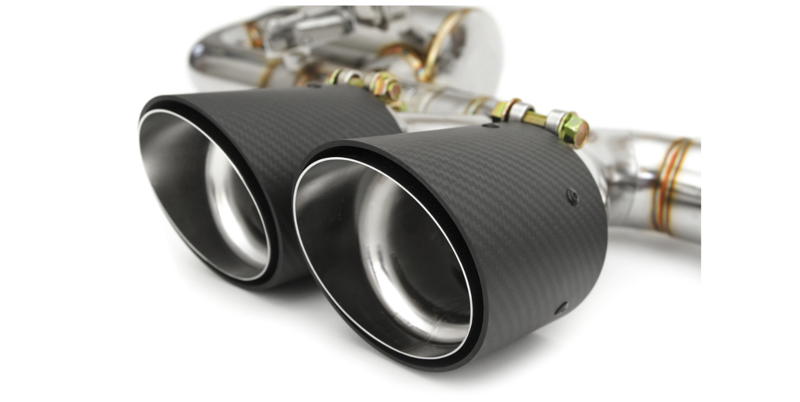 Fabspeed‘s Valvetronic Exhaust System is the ultimate catback setup for the ultimate streetable track car. 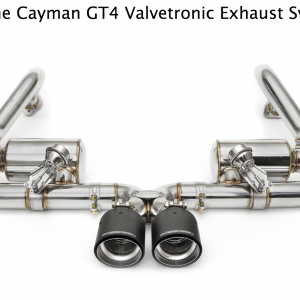 SOUND: We’re proud to offer a premium exhaust solution for the Porsche Cayman GT4. 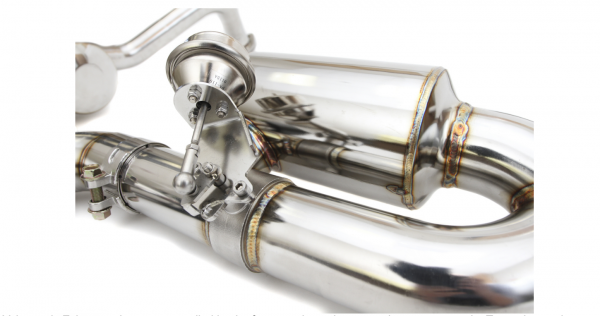 Our Valvetronic Exhaust offers two distinct tones depending on valve position: mild and wild. It was important to retain civility around town with valves closed, mission accomplished. You’ll be able to enter your neighborhood after a midnight joyride without having to explain yourself at the next HOA meeting. Open the valves, and you’ll be treated to a glorious roar befitting of the GT4. Burbles and backfires erupt in abundance, and downshifts summon a bark that will make all eyes and ears around focus on you. We’re not exagerating. This system will put an ear-to-ear smile on the most miserly of faces. 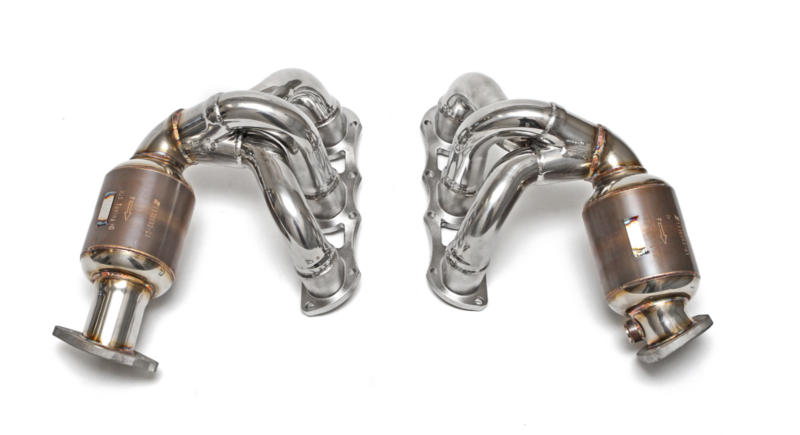 POWER: When combined with Fabspeed‘s Race Headers, our Valvetronic Exhaust System allows you to push 375 whp out of your GT4! Even with Sport Headers coming in at 371 whp, the gains in power are as impressive as the sound. The Fabspeed exhaust suite completely eliminates the torque dip in the 3500 RPM range and offers power gains all the way through redline. The increase in low end power will make a great difference in street driveability with the long gearing of the GT4. FINISH: Full polished T304L stainless steel, beautifully welded together and finished off with premium carbon fiber shrouded tips which fit the rear bumper of the GT4 like a finely tailored suit. Low-end power and sound that you can enjoy every day! 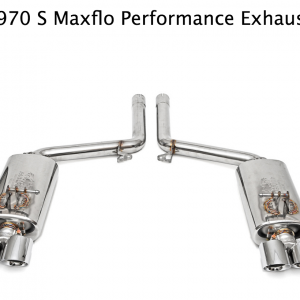 The perfect complement to either the factory exhaust system or Fabspeed’s performance exhaust systems, these high-flow headers are designed around HJS catalytic converters, making them the best upgrade for more enjoyable street driving and emissions compliance. 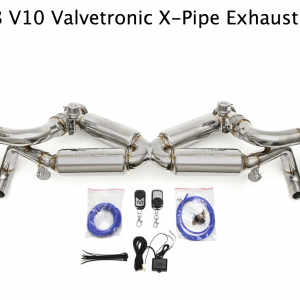 Designed with noticeable street performance in mind, these Sport Headers provide an additional 26 whp and 39 ft/lbs of torque at 3600 RPM. This translates to significantly better acceleration and throttle response when powering away from a stop light or merging onto your favorite highway. 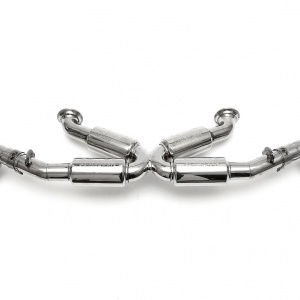 Thanks to the world-class performance of the HJS catalytic converter cores, your GT4 stays emissions-compliant in most regions and will not throw a Check Engine Light. In addition to the performance gains, Fabspeed’s GT4 Sport Headers also add great character to the exhaust note by improving the overall volume and tone. Power… Sound… No CEL… What’s not to love? The perfect compliment to Fabspeed’s GT4 exhaust upgrades, this high performance intake plenum from Innovative Pro Design and upgraded 82mm throttle body provide substantial power gains by increasing the efficiency and flow of the engine’s air intake system. After a very extensive R&D program, we are proud to launch the new GT4 IPD 82mm Competition Plenums specifically designed to work in perfect concert with the upgraded 82mm throttle body. This combination has proven to be extremely effective and deliver even more performance than doing either component on its own. The GT4 intake is nearly identical to the 987.2 & 981 intake. Porsche made a few upgrades with the 981 & GT4, most notably being that the GT4 draws outside air from both driver and passenger air intakes instead of the driver’s side only as previously found with all 986, 987 and 987.2 applications. IPD has developed a custom silicone hose designed to perfectly fit the larger 82mm throttle body and considerably improve air flow. The new GT4 Plenum also benefits from the internal dimpling effect that we are now implementing on all future Plenums. This internal dimpling allows us to control the boundary layer and maximize air flow. Just like a dimpled golf ball travels farther than a smooth golf ball. Controlled turbulent air creates less friction and “tumbles” over a given area more efficiently. Power gains with the GT4 Competition Plenum are virtually the same as with the 981 Competition Plenum, putting down 17 horsepower and 11 foot pounds of torque at the wheels. The bulk of the power gains from the IPD Plenum begin around 4000 rpm, continues all the way through to redline and become fully realized in the 6000 rpm range. IPD performance gains stay above both factory power curves throughout the entire rev range. The Aluminum Plenums do NOT experience heat soak under driving or racing conditions. It is true that aluminum has a higher thermal conductivity than plastic. In fact, aluminum is 650 times more thermally conductive than plastic and has a specific heat capacity that is 550 times higher than plastic. This means the aluminum Plenum actually spreads the energy it’s exposed to 656 times faster than the plastic and can store more than 550 times the amount of energy per unit mass. Bottom line, aluminum can absorb more heat than plastic, but it also takes considerably more energy to heat up and it’s losing that energy way faster than the aluminum allowing the IPD Plenum to remain cooler from outside ambient air under driving conditions, ultimately improving engine performance over plastic. Plus, why would Porsche utilize aluminum intakes on GT3’s, GT2’s, Cup Cars and Cup R’s? Proper airflow is crucial to an engine’s performance. When it comes to precisely engineered automobiles like the Porsche 981 Cayman GT4, every bit of optimization will help you get the most from your engine. That’s why we provide these BMC F1 replacement air filters. They fit perfectly in the GT4’s OEM air boxes and are built with the highest quality materials. Starting with its outer frame, BMC uses a special soft rubber material made in a process called “full molding”, which not only provides a much tighter seal around the filter, but also eliminates any potential cracking or breaking of the filter. The filter element itself is made of a washable cotton material that provides nearly 40% greater airflow than paper, enclosed in an alloy mesh screen which helps the filter keep its shape and protects against larger debris and dirt. The increased flow of air through the filter provides a steady stream of clean air to the engine, resulting in much more consistent and efficient power. 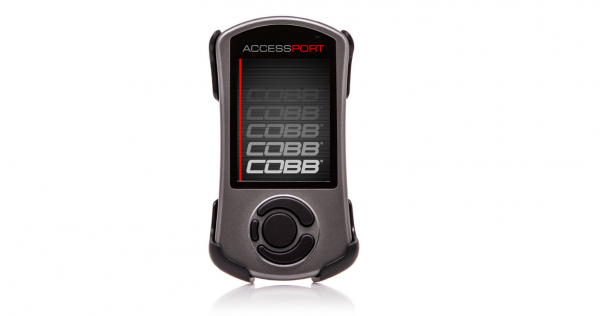 The Accessport V3 is the world’s best selling, most flexible ECU upgrade solution for Porsche. Unlock power hidden within the vehicle by replacing conservative factory settings with more aggressive calibrations. Upgrade forever with off-the-shelf (OTS) calibrations for most bolt-on modifications. The new in-cabin mountable Accessport V3 has a large, full color, higher resolution screen which allows you to monitor up to six parameters in real time. Fully customizable from the look (multiple bezel colors), layout (set up a race, street or dyno gauge cluster) and mounting options (choose from 1,000s of standard vehicle mounts). Of course, all of the great COBB tuning is included – with enough space for 100 calibrations. Side effects may include extreme euphoria and uncontrollable excitement. In some cases, users have experienced acceleration-induced tunnel vision. All parts are easily installed with no cutting or welding required, bolt on and go.